A unique event linking more than 25 historic sites across the Scottish Borders will open this year’s Scottish Borders Heritage Festival. Lighting the Borders, designated a signature event for Scotland’s Year of History, Heritage and Archaeology, will see sites such as Floors Castle, Ayton Castle and Peniel Heugh flooded with blue light for three nights from Friday 1 September to Sunday 3 September. In addition, 11 of the sites will also host special free and ticketed events over those three days, including music, theatre and living history, celebrating and reflecting on the region’s history, heritage and cultural diversity. This runs throughout September and includes over 200 events. It is being delivered by Live Borders in partnership with ourselves and the Borders Heritage Forum. View the full programme of events, including details of all the sites and events as part of Lighting the Borders. It will be the first time Floors castle, the home of the Duke and Duchess of Roxburghe, has been lit in this way. 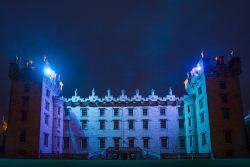 “Floors Castle is thrilled to be part of Scottish Borders Heritage Festival’s opening event 'Lighting the Borders’. “Promoting the unique history and heritage of the Scottish Borders is an integral part of our business and we welcome the opportunity to further this aim through inclusion in the regional Scottish Borders Heritage Festival programme. “2017 is the year to delve into the past and discover Scotland’s fascinating stories and unique experiences as part of Scotland’s 2017 Year of History, Heritage and Archaeology celebrations. “The historic environment forges connections between people and the places where they live and visit, as well as being an integral and iconic part of our national brand. “Lighting the Borders is an incredible opening to this year’s Scottish Borders Heritage Festival and will truly capture the attention of local people and visitors. “In addition to the lighting element, this opening event sees a remarkable variety of events taking place in historic sites across the Borders, including mass choirs, re-enactments and torchlight parades. Images are available on our Flickr page, including Floors Castle and Neidpath Castle lit in blue following a recent test of the lighting system being used.